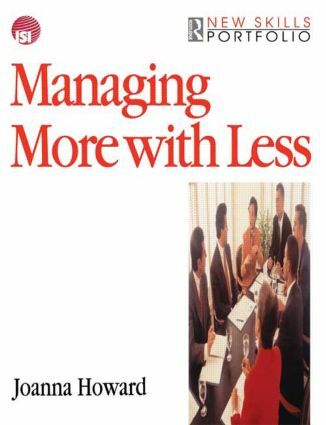 Managing More with Less is an innovative book linking a range of core management skills and re-interpreting them to meet current organizational needs. Aimed at managers in flat organizations, this book shows you how to deal with increasingly scarce resources to maintain a high level of productivity. The New Skills Portfolio is a groundbreaking new series, published in association with the Industrial Society, which re-defines the core management skills managers and team leaders need to be competitive. Each title is action-focused blending management initiatives/trends with a new flexible skills portfolio. The Industrial Society is one of the largest public training providers in the UK. It has over 10,000 member organisations and promotes best practice through its publishing, consultancy, training and advisory services. For more information contact their website on www.indsoc.co.uk. Thinking skills; Project management thinking; Prioritising intelligently; Influencing without authority; New approaches to time management and to time; Looking after yourself; Developing your potential.